For some weird reason, everyone that I know or follow on Twitter, has been humming the song ‘Suno Na’ from Youngistaan. Maybe its just the magic of Arijit Singh. But then Youngistaan did have an interesting premise, which was being jacked by an uninteresting lead actor, Jacky Bhagnani. Jacky, in his 5th film produced by his dad, is a persistent guy who is determined to juice out every penny of his dad’s account anyhow. Whether Vashu Bhagnani believes it or not, but him producing all the films for his son is creating a negative conjecture amongst the audience about his films. While Youngistaan may be the first decent film they have produced together, but people may not still come out to theaters because of Jacky’s unfavorable image with the popular audiences. To set the record straight, he is still not an ‘actor’, even after this one. Ramiz Ilham Khan, Maitrey Bajpai and director Syed Ahmed Afzal – a bunch of new writers work together on an interesting concept of a fish out of water when a race car obsessed game developer in Japan has to take over as the Prime Minister of India due to the demise of his father, who was the previous PM. Thrown into politics at the age of 28 and with a demanding live-in girlfriend, life is not going to be easy in India for Abhimanyu Kaul (Jacky Bhagnani). With Lok Sabha elections being the flavor of the season, Youngistaan is pertinent to the times and does offer a fairly researched and rational approach to an outsider taking up the most important chair of the nation, at least what is doable in a mainstream space because the audience really does not care about the subject or about understanding how does the office of a prime minister work. However, the dealings of a PMO office or of the chair are very surface level, with our young PM offering seemingly radical solutions off his gut like he was born with them, always to the clap of orchestrated background music. What makes Youngistaan interesting is its juxtaposition of the PM’s personal life with his politics, where he is living in with his girlfriend who also gets pregnant later on and how a nation needs must grow up to understand that. The combination of the two equations is handled well enough, but a focus on it weighs down on the credibility of political side of the film. No situation ever appears to be hard enough for Abhimanyu, and he seems to be the guy who was born for politics. His backstory of being a game developer is restricted to minimal usage in the latter part of the film. A lot of preachy stuff is thrown rigorously towards the climax which may make you cringe. But with all the fallacies, Youngistaan is fairly engaging and never ludicrous. Some moments between Abhi and Anvita, his girlfriend, are handled with great care and Afzal takes care to keep his focus on the combination of his two lives. I may be overselling him here but he does show a promise of doing much better in future projects. Produced by Vashu Bhagnani’s Pooja Entertainment along with MSM Entertainment, and released by PVR Pictures, Youngistaan has been made on a generous budget to allow for good production values. Music by Jeet Ganguly, Sneha Khanwalkar, Shree Ishq and Shiraz Uppal is a good combination of genres, and songs never interrupt the screenplay. Suno Na by Arijit Singh is the pick of the lot, of course. Amalendu Chaudhary‘s cinematography is warm and easy on the eyes while Anuradha Singh‘s editing leaves a lot to desire. Maybe there wa something wrong with the print that I saw, but I noticed 2-3 very abrupt cuts which made me question the editor. The star performer of Youngistaan is the amazing Farooque Sheikh, as the Prime Minister’s PA. Sadly, he is no more in this world and Vashu Bhagnani pays a respectable tribute to him before the film. Sheikh is a natural, and he thrives even in an underwritten part. Neha Sharma is so pretty that her hammy lines can be ignored anyday, but she is definitely showing improvement in terms of the projects she picks. Jacky Bhagnani, saddled with a fairly difficult character, tries his best to do justice to it, but can only provide limited expressions. He is still way better than any of his past films. Father and son, Boman and Kayoze Irani do not get much scope in their parts. Mita Vashisht is a strong performer who is wasted here. Other supporting actors do well in their limited space. 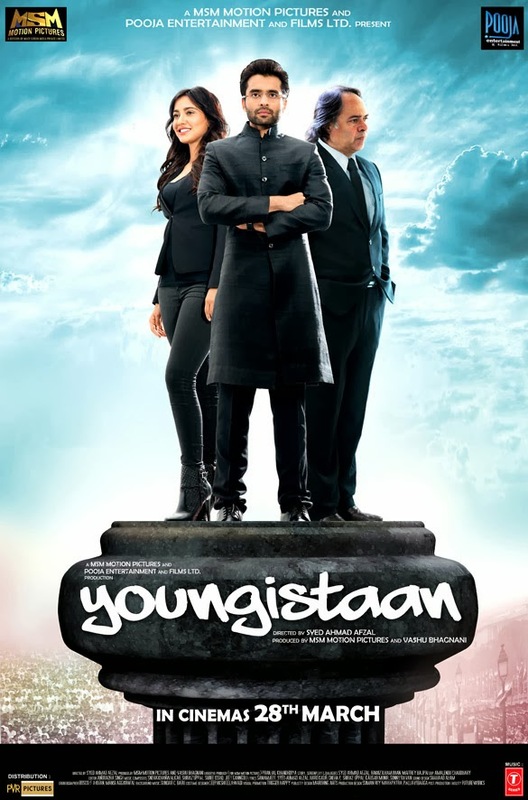 I expected Youngistaan to be a campy parable of a politically accurate India, almost like a fantasy. But it is a fairly decent take on a personal story with a stress on the importance of voting and youth power. Afzal’s direction is pretty good for a newcomer and despite its superficial approach into the nation’s problems, it stirs up interesting situations by focusing on the PM’s love story. The film seemingly has a good word of mouth, and I would not like to berate it either. Amidst a sea of despicable Hindi films last week and this week, Youngistaan is a good one time watch, all of it done well within a mainstream space. Rangrezz Movie Review: Banality and Unintentional Hilarity of the Highest Order!